What a deliciously colourful way to round off the year’s textile courses! We spent the weekend under the expert tuition of Debbie Siniska making ‘Gorgeous Rag Rugs’. We chopped and snipped, prodded and poked with hooks and bodgers to fasten strips and snippets of fabric – all recycled – into lovely natural hessian to make our samplers and first experiments in this most rewarding of traditional crafts. I have childhood memories, as I expect many of you may have, of sitting in front of the fire playing with the tufts of reworked tweeds, calicos and cottons. There was often quite a bit of grey or black flannel (former jackets, trousers and ‘costumes’ – remember them!!??) which contrasted with bright cherry reds and smokey blues. Whilst the basic principles of these techniques are very straightforward, Debbie showed us how to master the differing ways of handling the variety of fabrics with different tools in order to achieve our designs using loops and tufts to their best advantage. 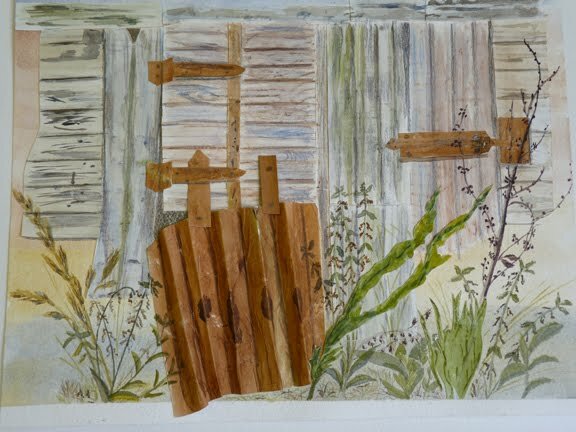 One of this year’s students Jane Anne Walton worked on a beautiful piece based on her design taken from a cranesbill. This is destined to be a seat pad. Just lovely and much admired. 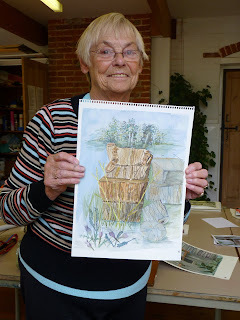 Jane Anne coordinates a rag rug group which meets at her house in North Norfolk monthly. Give her a ring on 01263 861369 to find out more. Debbie will also be a guest artist on Kirsty Allsopp’s new series which begins this week, see Radio Times article etc. for more details. I’m not sure yet which programme in the series that Debbie will be showing Kirsty about rag rugs. Keep an eye open as the series should be a wonderful ‘craft’ exploration. I’m so pleased to announce that Debbie Siniska will be returning to BAC next autumn to draw absolute beginners to this fascinating craft and to help those who have some experience to develop their designs and skills further. Look on Debbie’s website www.debbisiniska.co.uk to see the lovely work she does, including commissions for restoration projects such as the ‘Bloomsbury’ rugs. Guaranteed to make you smile! Our new 2011 course listings will soon be finalised and put on this blog, so WATCH THIS SPACE! 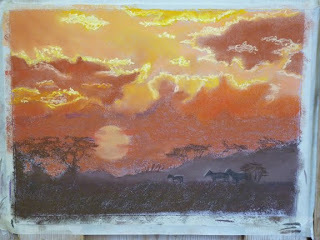 Another great pastel course ably delivered by professional Norfolk based artist and experienced tutor, John Patchett. John is one of our most popular visiting tutors and this was a real cracker of a course. The title 'Skies and sunsets' brought out the very best in everyone on the course who as you can see produced some exceptional work. 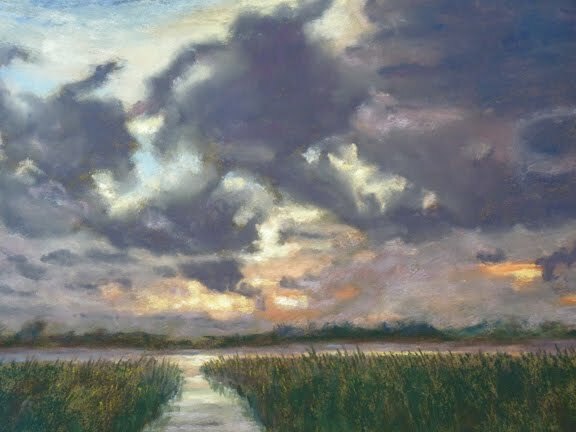 There are still a few spaces on John's last weekend pastel course with us this year on OCTOBER 9/10th - 'IMPRESSIONIST PASTELS' - A great opportunity to explore the loose Impressionistic approach to pastel painting which typifies John's own beautiful work. How does the weather know when it's a Bank Holiday? I'm sorry if your activities this last weekend were dampened or even washed out. However it made not a jot of difference to our three days in the studio where a group of very enthusiastic printers ( some beginners, some more experienced ) joined Laurie Rudling to create and print Collagraphs. This year we extended the course to three days - well worthwhile. It meant that plates could be more detailed and finished and thus enhance the quality of the work. It involves collaging ( as the name suggests ) papers, card, fine fabric or textiles, threads, sometimes with carborundum powder, onto a card plate. It is then varnished and can be further detailed by pressing or incising into the dried varnish. This method of printing gives the subject a transparency and an almost ethereal quality. Laurie is an absolute master of this technique. Do look on his website. His work will be on show at the Norwich Print Fair which opens next week in St Margarets Church (St Benedicts Street, Norwich) and also from the following week he is taking part in the valedictory exhibition Twenty by Twenty at the King of Hearts Gallery in Fye Bridge Street, Norwich. Next year 2011 Laurie will tutor two courses at BAC. July 30th and 31st will be two plate etching using 'safe' materials and processes. 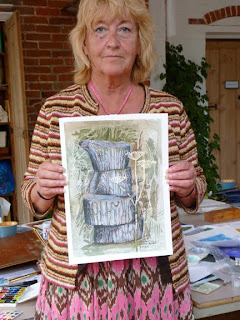 Then October 15th to 17th will be three days of collagraph printmaking. Email me at bac@berryhall.plus.com for further details. In the meantime here are some more images of last weekend to whet your appetite! 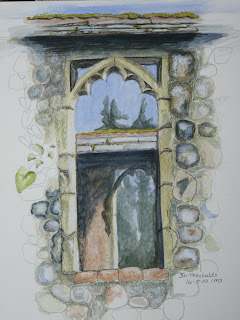 Exploring textures in watercolour, pencil, pen and ink. A lovely group of people on this course - a delight to teach and so responsive. We had a lot of fun and humour throughout. 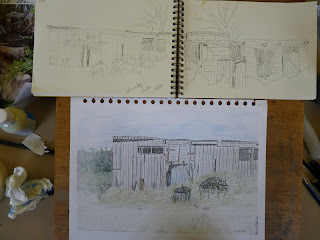 Weather was pretty attrocious but we made the best of it by nipping out for the odd hour to some lovely nearby locations and then back in the studio to work on the paintings and drawings. 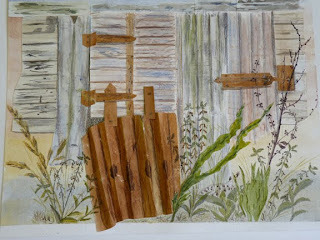 Mixed media is so versatile and with added collage a lot of fun too. Have a look at some examples of the students work on this course and one lady was a complete beginner. It's amazing what you can make out of a pile of old logs! A very enthusiastic group joined William Calladine last week to set out on the adventure of ‘Painting Reality’. This five day course is the first of a three part series, making a practical in-depth study of the methods and craftsmanship of the great masters of classical European oil painting. This year’s group, as with previous years, were astounded and in awe of William’s vast knowledge and expertise. 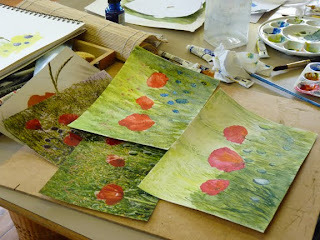 He delights in showing them how to gesso their boards, grind pigments and add various mediums to obtain their paint. Then there’s the painting in of the underlying structure of the composition and over successive days building up the layers of paint to achieve the form and luminosity of the subject. The work produced by the students was terrific as you can see and all intend to be back for Part II next spring to further their quest. Last week we welcomed back Andrew Fawcett, a regular tutor at BAC who has a wonderful fund of knowledge and experience painting icons and frescos as well as a lesser known technique of incising on glass known as Verre E'Glomise. 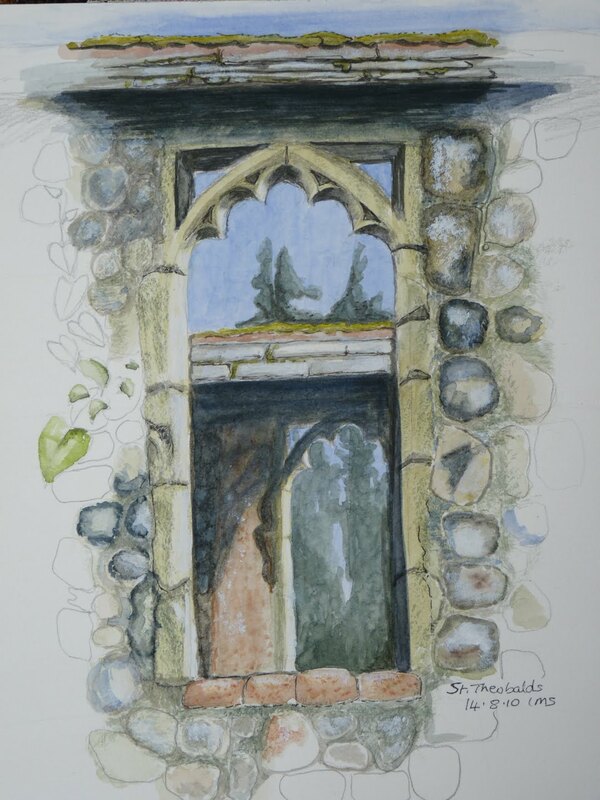 All these techniques were in common use from the 11th - 16th centuries in Europe and have provided the background to our present day painting methods. Andrew’s own work is truly beautiful and he also has a terrific gift of being able to pass on these methods of working to his students. We are delighted that he will be tutoring again for us next year so watch this space for forthcoming dates for this. 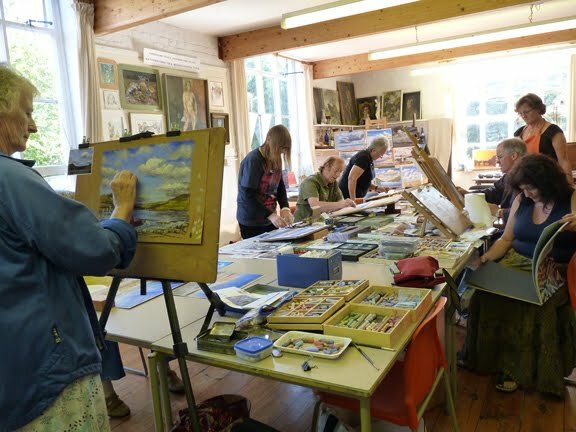 Sue Williams and John Shave from Sussex have recently visited us to tutor hugely popular courses inspired by the hedgerows, gardens and landscape of Norfolk. Sue's two day flower painting workshop using acrylic inks showed our students how to branch out and explore the potential of this lovely new media and John's patient and informative landscape painting course in oils attracted some new as well as regular students. The weather was kind and many delightful small oils were achieved working in the studio and outdoors in some of the favourite haunts immortalised by Edward Seago. Sue and John have agreed to tutor for us again in 2011. Sue will be taking students 'Around the Farm' from July 19th - 21st and also offering a two-day workshop 'The mystery of Venice' in acrylic inks on 10/11th Sept.. So even if you may never have the opportunity to travel to Venice, you can still learn how to achieve its fascinating colours, textures and atmospheric qualities working in our studio. John will show you how to 'Paint sunshine in UK and abroad’ on July 22/23/24th. John and Sue will join forces for a one day workshop on Sept 12th 'Extract - Subtract and Abstract' - An introduction into Abstract painting in any medium. Also in Sept John will be taking you to some lesser known beauty spots for painting in oils the 'Wide skies and watery landscapes' which make up the beautiful and unique Broads scenery. Dates for this are Sept 13 - 16th. 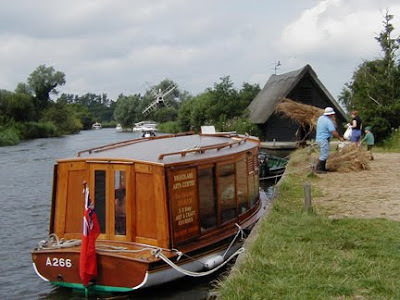 Angela's own classic Edwardian motor launch 'Golden Sunset' makes an ideal form of water borne transport for three days experiencing the delights of the Broads in summer. 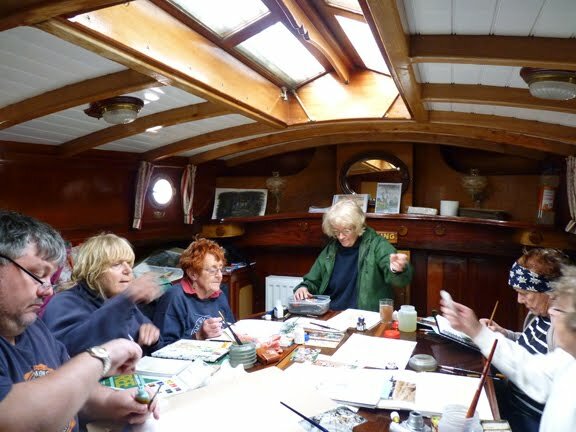 This was an additional course by popular demand from students and entailed three full days of sketching and cruising to some of the choice painting sites on the Northern Broads system of inland waterways which are largely inaccessible by foot or road. We are planning a similar course for 2011 and are already taking bookings. Only 5 maximum on this unique course. Contact Angela 01692 536486 or 01702 475361. 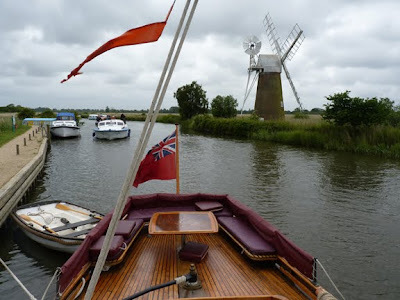 For all you active folk who love sailing and want to see the Broads from the water, we have recently had our annual cruise on 'White Moth' a beautifully restored Edwardian pleasure wherry. With eight people aboard we set off from her home berth at Horning for four glorious days afloat accommodated on board in her comfortable cabins and spacious saloon. In June when the Broads are at their best with so much wildlife and flowers everywhere, it was a tossup as to whether we would paint and sketch or just watch the world go by, as Kim our professional skipper sailed this majestic craft. If you would like to join our 2011 cruise on 'White Moth', then get in touch with Angela on 01692 536486 or 01702 475361. Do it soon as these cruises are always very popular and fill up quickly. Yesterday I called in at the King of Hearts Art Centre, as I usually do whenever I'm in the Magdelen Street area of Norwich. I was delighted to find a terrific exhibition by Liz McGowan and Malca Shotten, Studies of Happisburgh Shoreline. Really powerful drawings, paintings and sculpture in response to the crumbling cliffs and the resultant forms on the beach. It's not to be missed and the sort of exhibition that the King of Hearts does superbly. Upstairs music was being played and other visitors were sitting out in the beautiful courtyard enjoying lunch from the restaurant in the sunshine. Imagine then my horror to find that the centre is to close at the end of the year due to financial problems brought about by the current climate. I'm furious that this oasis of all that is good about the arts today is to go, and that the Arts Council won't help because it's 'too small'. No funding can be found to support it. I am tempted to think that a few bankers' bonuses should be raided, as their negligence is the main cause of this. How many other small and very worthwhile arts foundations are in similar trouble. If you are in the area and can get to the centre and enjoy its facilities please do so. Then, if like me you feel it's a gem, get in touch with the EDP newspaper and rant a bit to see if there's anything to be done even at the eleventh hour. ...please feel free to leave a comment, we'd love to hear from you.